Thursday I got a giant box on my doorstep but I haven’t had the time to take some pictures and do a write up until now. Inside the box was the Flash Uni-Formz three pack. For those who haven’t seen them, Uni-Formz are DC’s foray into the urban vinyl market. Vinyl figs are certainly becoming more mainstream with things like Mighty Muggs, Uni-Formz, and Disney’s Vinylmation. I’d like to think I was a little ahead of the trend on this one having my house inhabited by a few Munny figures, a Labbit, and Kid Robot’s mascot dressed like the Man with No Name. The Flash set is the fourth release in the Uni-Formz series. Batman, Superman, and Green Lantern all came before it. All of the figures use the same basic body, only a new head and minor other features are added to the body to change the character. Add a ring to the Lantern’s hand or put a cape and belt on the Superman; that kind of thing. Each set contained the main character and two types of variants. Modern Batman got a Classic and Armored Version. Modern Superman came with a Cyborg and Lifesuit version. Green Lantern came with a Silver Age and Blue Lantern version. Flash comes with a Zoom and a Black Flash. I think the Flash set comes out better then the others, at least each figure is a different character rather then a costume change. So how does DC’s Flash Uni-Formz rate? Keep reading after the jump. I’m going to start with the basics. The figures come in a nice looking windowed box that would let you display in box if you were inclined. But really, these need to be opened. They stand about 8” tall and although you can tell some parts are hollow, they have some heft to them. They feel very sturdy. I was surprised by the articulation. The neck, arms, forearms, wrists, waist, legs and ankles all can be moved. You aren’t going to get a lot of different poses out of these guys, but you have more options then I would have though. The Flash figure can be purchased by itself, but to get Zoom and the Black Flash you have to buy the entire set. Since Zoom and B.F. are basically just repaints of the main Flash figure I’m going to tackle each paint job separately. The Flash: The first thing you notice is how shiny and deep the red is. It is really a beautiful color. The eyes are whitened out, his symbol is painted on, there are no wings on his boots, and his lighting belt goes straight across. Why am I pointing out these details? Flash fans have become critical about costume details because for a long time it was the only way to tell which speedster was under the cowl. Dark red suit, wingless boots, and white eyes are usually associated with Wally West. While the straight across lighting belt is part of Barry Allen’s costume. So which Flash does this figure represent? I don’t know and it doesn’t really matter to me to be honest. But I would guess it would drive some Flash fans crazy. Zoom: A perfect palette swap of the Flash. He comes off less impressive at first glance since the yellow doesn’t have the same pop as the red. It is still shiny, but the yellow hides it. 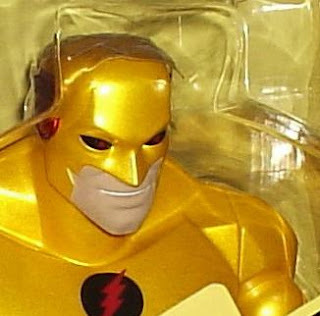 Other then swapping red for yellow and vice versa he is almost identical to the Flash figure. It is a little disappointing that he isn’t scowling or something to give him a more sinister appearance although the black and red eyes do make him look pretty evil. Black Flash: The Black Flash was death to the speedsters. He would show up right before someone connected to the Speed Force was going to die. In my opinion he is also the star of this set. He is matte black with a darker, shiner black for details. Then the paint application on his face is terrifying. He is a striking figure with the few bits of shiny red next to the black. Add to that I don’t think there has ever been any Black Flash merchandise outside of a T-Shirt. No, the figure of Zoom as a Black Lantern does not count. So should you track down the set and buy it? I can’t make that decision for you. The Flash by himself runs about 40 bucks. The limited release Zoom and BF are pricier, the whole set costing close to 200. The set is a limited run, when it is sold out it is gone for good. The costume confusion may turn off some diehards. Is it Zoom or Professor Zoom? Is it Barry or Wally? The stylized body that the Uni-Formz use aren’t going to be for everyone either. Personally I’m happy with the purchase. Right after I took the pictures I rushed to add these three to my Flash display case. Did I say Flash display case? I did but that will have to wait for another day. Very nice. I'm definitely going to try and track these down. Where did you order them from? I got them from Big Bad Toy Store, but I think I saw them a little cheaper at another site the day after I put in my order. I picked up the red one and really like it, although it cost me $50. I thought the box design was really sharp. And I was thrilled to see that to me, at least, it is Wally (I can ignore the belt). Although, the title actually says, "Classic" The Flash - so perhaps they intended Barry.